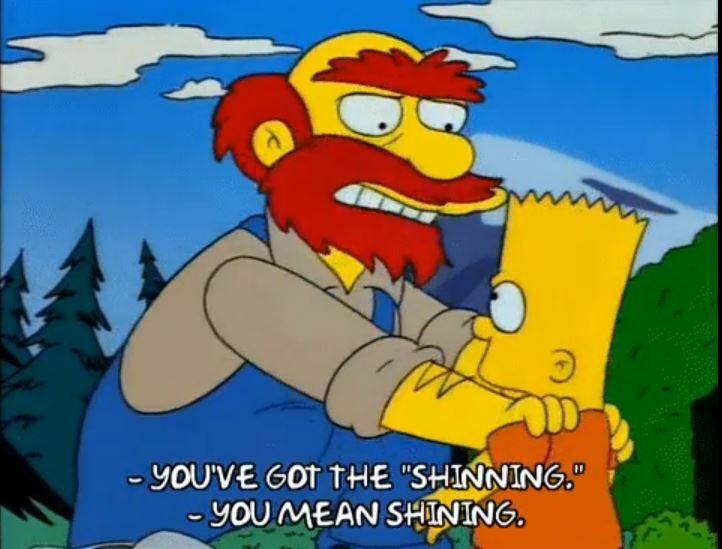 Being an intellectual property attorney, one of my favorite interchanges from The Simpsons comes from the episode that spoofed the Stephen King horror movie The Shining. The town of Scottsville, Virginia, can relate. In 2014, the town started a fall Harry Potter festival. Two years later, the festival drew about 9000 people. Then the owner of the Harry Potter franchise, Warner Bros., objected that the event constituted trademark infringement. Scottsville consequently cancelled the 2017 festival. This past fall, it hosted a “Wizarding Festival” that included activities such as quidditch lessons. But the town avoided expressly referencing Harry Potter. Warner Bros. didn’t object. Let’s say your company or community organization wants to have an event based on a popular movie, TV show, or book (a “franchise”). How far can you go in referencing that franchise without getting in legal trouble? Don’t assume that, if the franchise owner objects, it will be satisfied with you stopping the use of its names and images. Sometimes the content owner demands money in settlement. Pokémon Company International demanded $5400 from a Seattle café that had a Pokémon-themed event. Yet, usually these companies are not objecting just to make money. If they don’t enforce their intellectual property rights by preventing unauthorized use, they could lose them. • Don’t use the name of the movie, show, or book or specific names or images from it. • It’s usually okay to hold an event that suggests the theme of a franchise if you don’t use its names or images. For example, Warner Bros. once told a target it did not object to a business holding “a generic wizard/Halloween” event. • Don’t say or suggest your event is sponsored by, affiliated with, or endorsed by the franchise. • It’s okay for people to show up in costumes that are characters from the franchise. But don’t expressly reference the franchise in encouraging them to do so. Regarding Harry Potter, encouraging people to show up “in your favorite wizard costume” shouldn’t get you in trouble, but encouraging them to show up in “your favorite Harry Potter costume” likely crosses the line. • It’s okay to sell official, licensed merchandise of the franchise you are evoking. But keep the advertising of that offering to the minimum necessary to inform the public such items will be for sale. Also, such advertising is close to the legal line and invites scrutiny. It’s almost always infringement to use of a franchise’s property for a money-making venture. Being a nonprofit or raising money for charity does not does not exonerate you. It won’t be a defense that your profit was small or that you failed to earn a profit. Just obtaining revenue by trading on a franchise is enough to get you in trouble. Many business owners argue that their theme events should be okay because they increase interest in franchise, which should lead to increased sales for that franchise (e.g., more Harry Potter books sold). That rationalization won’t protect you. It’s in the franchise’s discretion as to whether to let things go based upon that viewpoint, not the court’s. Participating in another organization’s infringing event can get you in trouble. For example, if a chamber of commerce hosts a Harry Potter event and your business participates and uses Harry Potter names or images, you could be a target. Usually the franchise owner sends its cease-in-desist letter to the overall operator of the event and works through it. Still, nothing in the law keeps the franchise from making a claim directly against you as a participant. You can use names and images from the franchise if you get a license from it. You probably won’t. Some franchises appear to not give licenses. It appears Warner Bros. doesn’t give licenses for Harry Potter events, for example. It’s usually uneconomic for franchises to give licenses for small events. The modest fees you would pay would be overwhelmed by the franchise owner’s legal and business costs in negotiating, administering, and policing deals. Still, check the website of the franchise owner. Sometimes licensing is available online.